Registro ¿Ha olvidado su contraseña? Pensamos que la presentación les ha gustado a Ustedes. Para descargarla, por favor, recomiéndenla a sus amigos en cualquier red social. Los botones se encuentran debajo. ¡Gracias! ¡Feliz Día de San Valentín! 1 ¡Feliz Día de San Valentín! 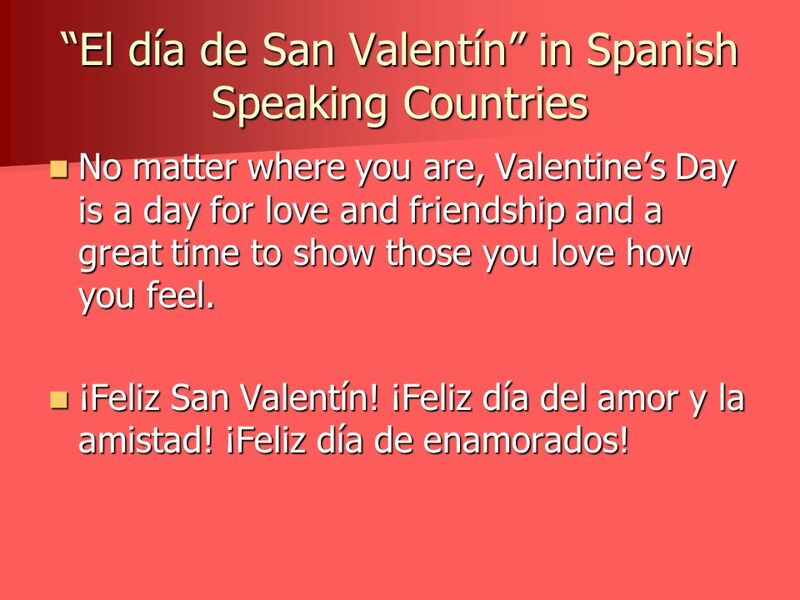 In most of South America, Valentine’s Day is known as “El día del amor y la amistad,” or Love and Friendship Day. This special day is not just for lovers! Many groups of friends exchange Valentine’s cards and gifts and later go out for dinner, all in the name of friendship. In Spain, Valentine’s Day is celebrated in much the same way as in the U.S. and the U.K. 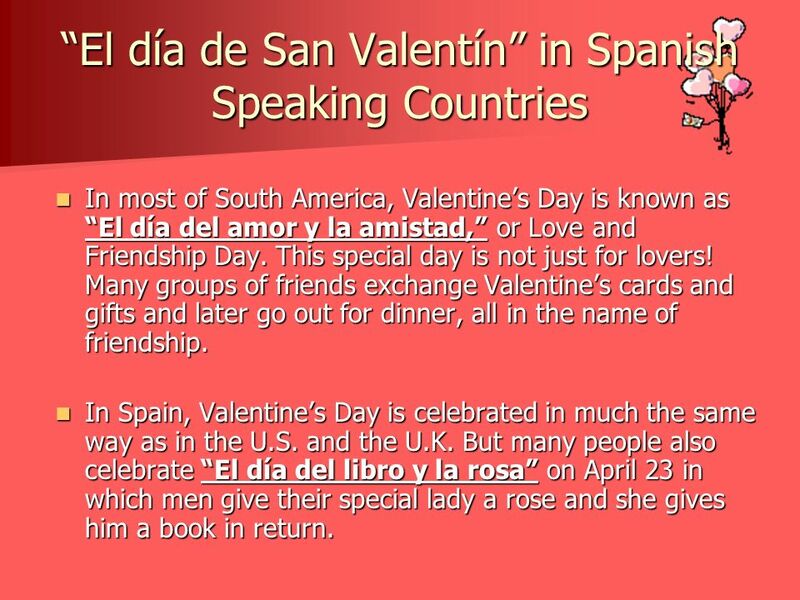 But many people also celebrate “El día del libro y la rosa” on April 23 in which men give their special lady a rose and she gives him a book in return. In 2009 in Venezuela, Valentine’s Day eas canceled! Or, rather, postponed until the 16th where it will be celebrated for a whole week. 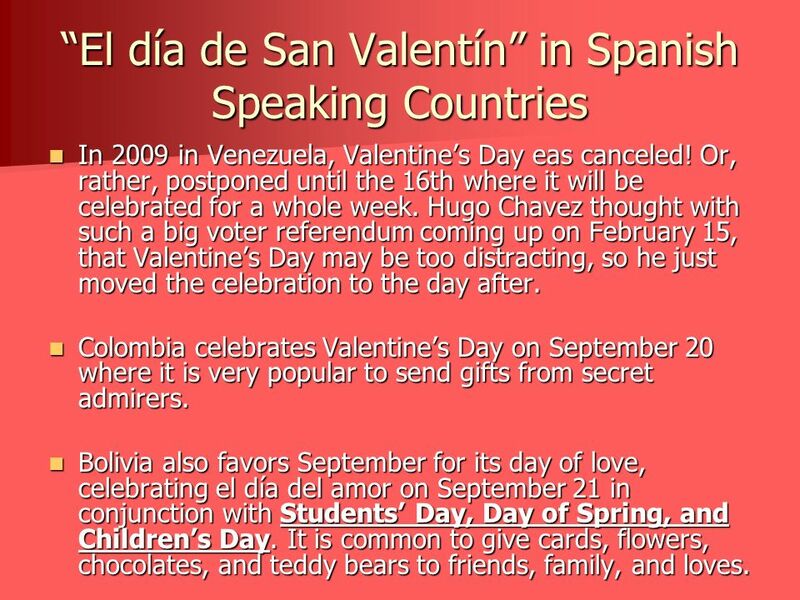 Hugo Chavez thought with such a big voter referendum coming up on February 15, that Valentine’s Day may be too distracting, so he just moved the celebration to the day after. Colombia celebrates Valentine’s Day on September 20 where it is very popular to send gifts from secret admirers. Bolivia also favors September for its day of love, celebrating el día del amor on September 21 in conjunction with Students’ Day, Day of Spring, and Children’s Day. It is common to give cards, flowers, chocolates, and teddy bears to friends, family, and loves. No matter where you are, Valentine’s Day is a day for love and friendship and a great time to show those you love how you feel. ¡Feliz San Valentín! ¡Feliz día del amor y la amistad! ¡Feliz día de enamorados! 5 Una carta de amor Usando las corazones dulces, escriban una carta de amor a alguien en la clase. 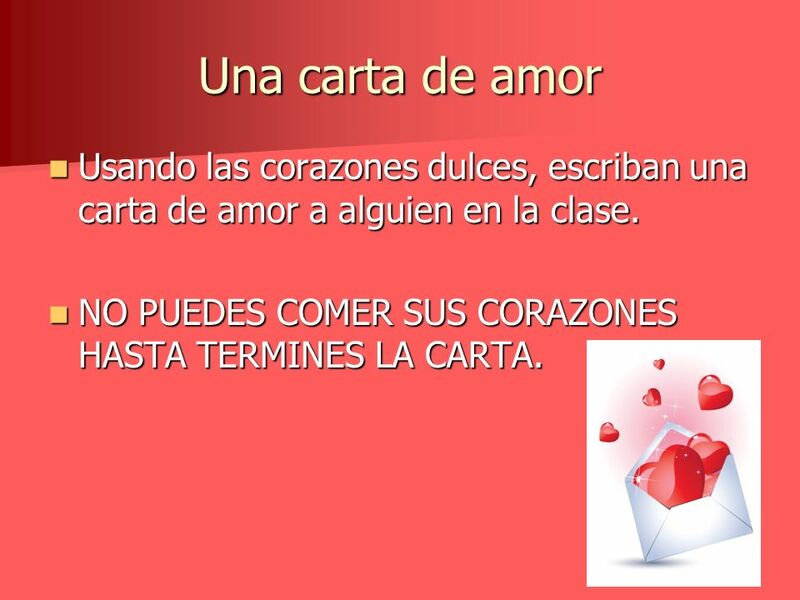 NO PUEDES COMER SUS CORAZONES HASTA TERMINES LA CARTA. 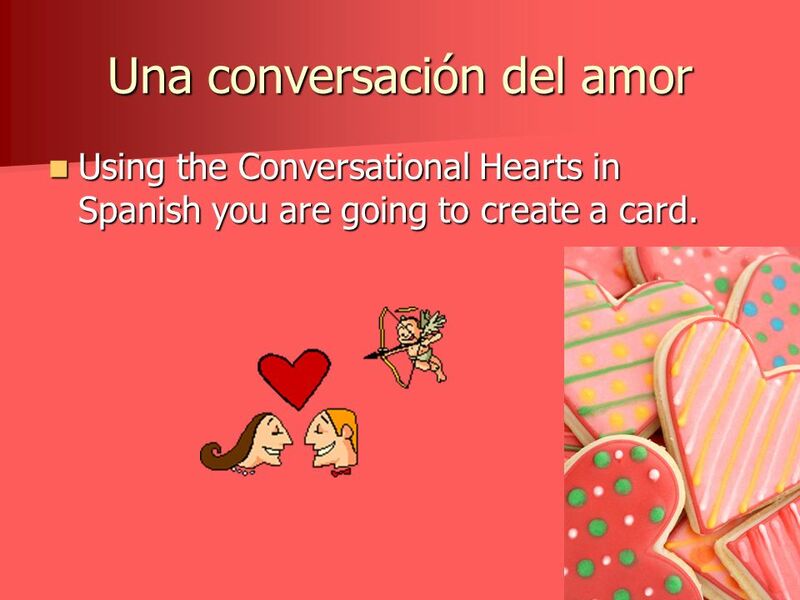 Using the Conversational Hearts in Spanish you are going to create a card. 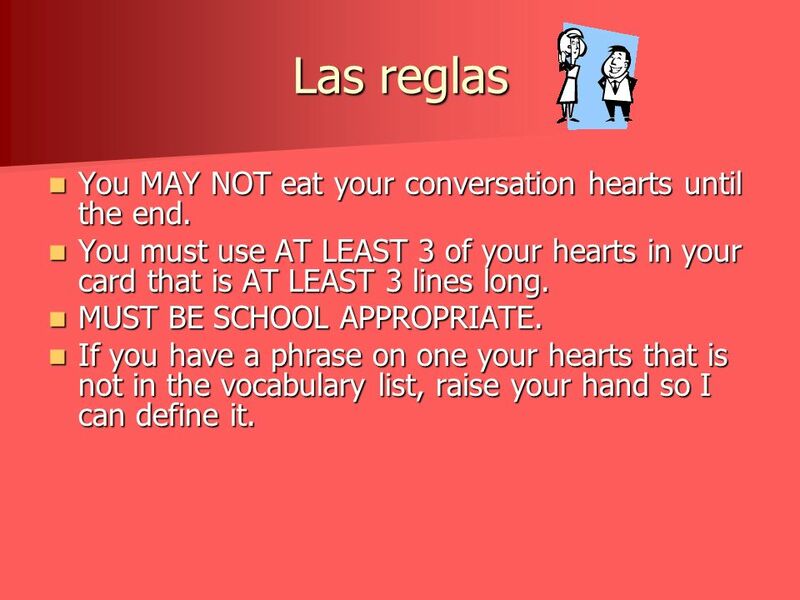 8 Las reglas You MAY NOT eat your conversation hearts until the end. You must use AT LEAST 3 of your hearts in your card that is AT LEAST 3 lines long. MUST BE SCHOOL APPROPRIATE. If you have a phrase on one your hearts that is not in the vocabulary list, raise your hand so I can define it. 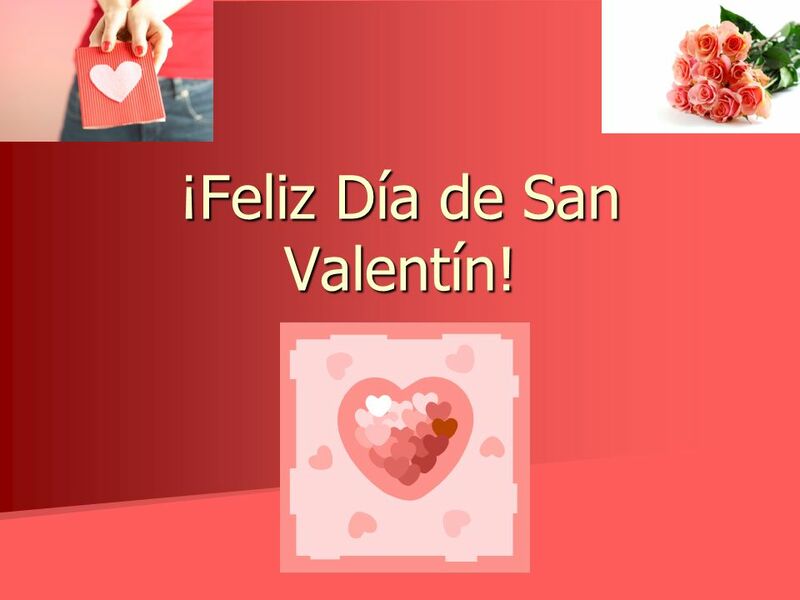 Descargar ppt "¡Feliz Día de San Valentín!" Telling Time (Cómo decir la hora). 3 al día  1. List 5 cities and / or states with Spanish names. Mr. Redaelli OnlineTaco.com. 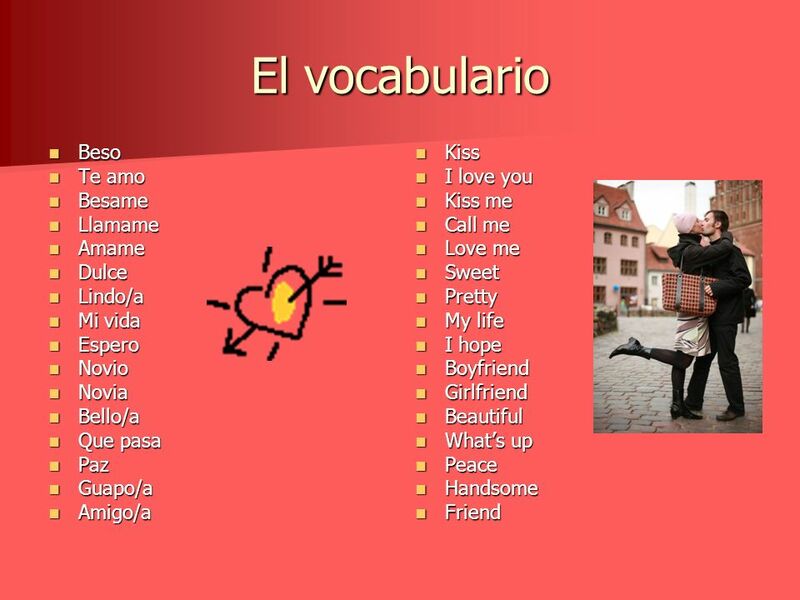 To Have - Tener Yo tengo – I have Tú tienes – You have (Informal) Usted tiene – You have (Formal) El tiene – He has Ella. La a personal. The basic rule The a precedes a specific person or persons used as a direct object. – Levantó la taza. He lifted the cup. – Levantó a la. Direct object pronouns. What is a Direct Object? The object that directly receives the action of the verb is called the direct object. The direct object. To be, or not to be? Lets start out with one of the most important verbs in Spanish: ser, which means to be. Telling Time Grammar Essential #8. What is a subject pronoun? A subject pronoun is a personal pronoun that can be used as the subject of verbs. 1 3 WAYS TO ASK A QUESTION 1.Add question marks to a statement. 2.Add a tag word to a statement. 3.Use a question word. ¿Qué hora es? What time is it? (What hour is it?). Unlike what you would imagine El día de los muerto, or Day of the Dead, is really like, it is not a sad, mourning event. Instead, it is a fiesta to celebrate. Middle School Spanish. Sigue las direcciones Necesitan un lapiz o un boli y un cuaderno – You need a pencil or pen Saquen un libro Saquen el foldable. and Materiales Escolares Lapiz Boligrafo Cuaderno Libro: Expresate Annuncios: Projects will be graded as soon as I can get to them. These are my books. Those are yours. I saw their car in the garage. Have you seen ours? I ate my cookie yesterday. Did George eat ______? We went to our.